Among these new companions, two appear at angular separations ranging between 0.8 and 1.2 λ/D (i.e. 80 and 110mas⁠), demonstrating that from the ground, kernel-phase makes it possible to achieve a resolution better than the traditionally accepted diffraction limit of a telescope. 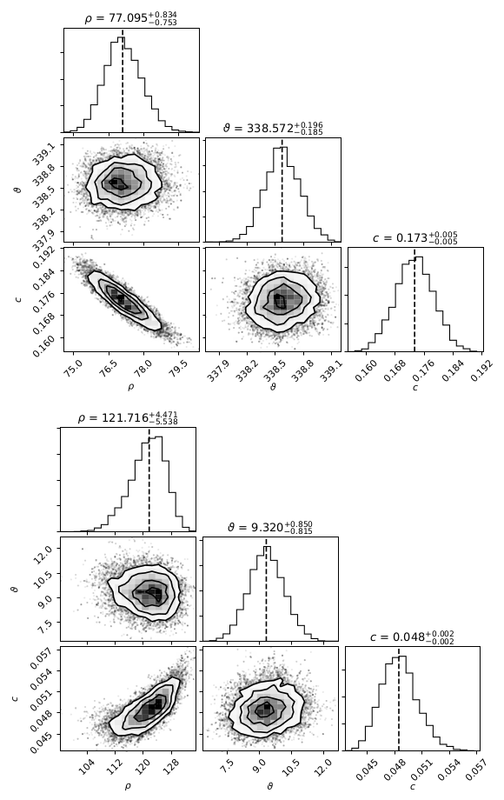 Corner-plot of the best-fitting parameters for the two close companion candidates HIP50156 (top) and HIP39718 (bottom) recovered by the kernel-analysis of archival VLT/NACO L-band images. Back in November last year, the concept of kernel-nuller was featured as one of the ten projects selected by the SATT Sud-Est in the context of the innovation challenge called “My Innovation Is…”. Yesterday, the following video was posted on youtube… enjoy! 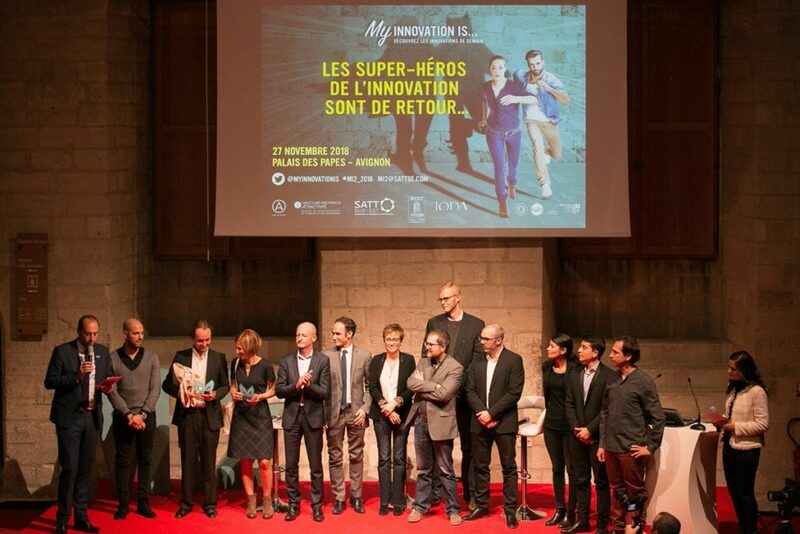 SATT Sud-Est and its partners present the Superheroes of Innovation, winners of the My innovation is… 2018 competition. During the third edition of the “My Innovation Is…” competition, held on November 27, 2018 at the Palais des Papes in Avignon, France, 10 researchers and future startuppers from the public laboratories of the South & Corsica Regions presented their innovative projects before a jury of experts. Ignacio CASUSO, Inserm, is able to visualize the nervous system at the molecular level. 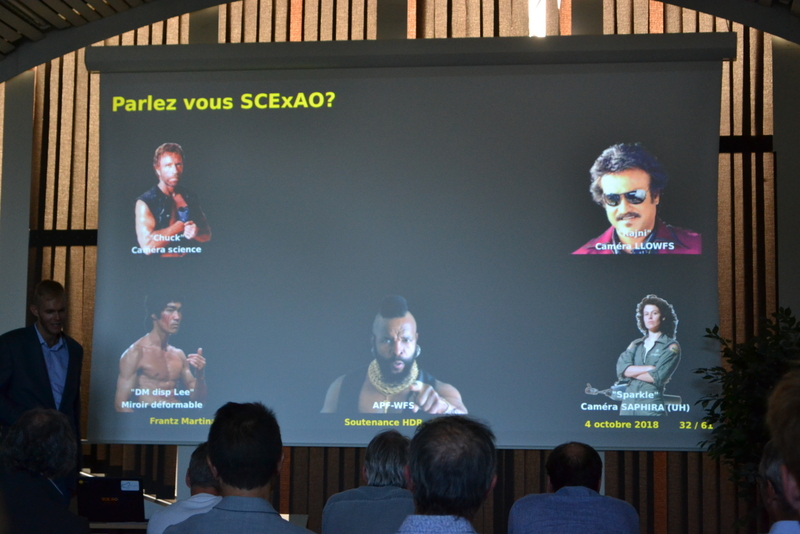 Sébastien GIRAUD (Aix-Marseille Université) is able to evaluate proprioception to better communicate with our body. Olivier CHUZEL of Aix-Marseille Université has the power to selectively kill cancer cells. Soraya MEZOUAR (Aix-Marseille University) is developing a new therapy using placental stem cells. 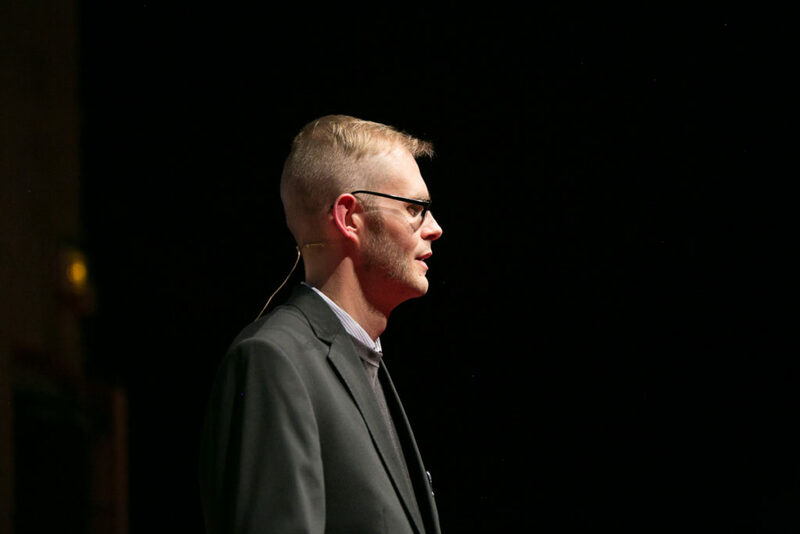 Eric LECHEVALLIER (AP-HM) can describe and quantify the intensity of a bleed using a connected tool. Manuel ESPINOSA of the University of Corsica controls the storage of solar energy. Christine CONTINO-PEPIN from Avignon Université is able to extract and stabilize compounds of plant origin in an eco-compatible way. Michel Alain BARTOLI (AP-HM) is developing a stent graft dedicated to the endovascular treatment of aortic diseases. Mikaël CHELLI of the Centre Hospitalier Universitaire de Nice masters medical statistics thanks to an autonomous application. Frantz MARTINACHE (Observatoire de la Côte d’Azur) reveals the presence of extrasolar planets in search of habitable worlds. Faced with a merciless jury, they had to fight to convince and ensure the next generation of innovation. Romain Laugier, PhD student contributing to the KERNEL project, saw his first paper accepted by the journal Astronomy & Astrophysics. The paper shows how images affected by some amount of saturation can be salvaged to make them kernel-compatible again. Using an archival HST/NICMOS dataset from 1997, Romain was able to show on a known low-mass binary that the recovery algorithm is effective. The signature of the 4.36 magnitude contrast companion, invisible in the original image, is present in the kernel-phase extracted from that image. This kernel-signature was used to constrain the position and contrast of the companion. Saturated HST/NICMOS image of Gl 494. 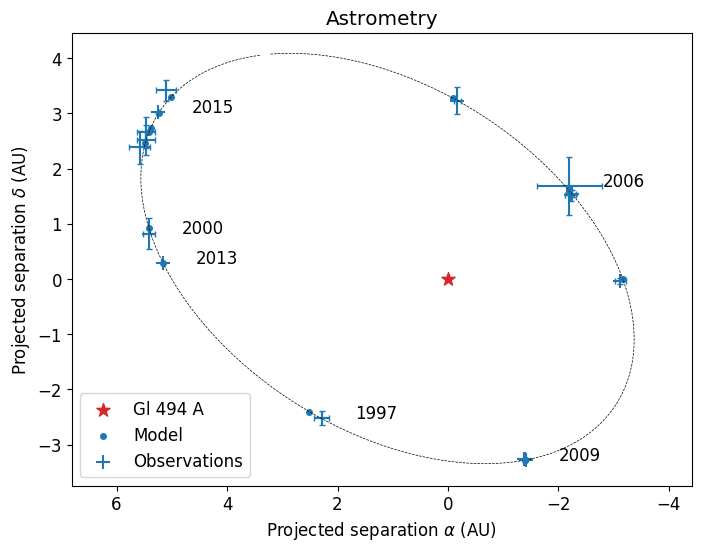 This new resolved observation of the low mass companion to Gl 494 along with other recently published images, combined with a long series of archival radial velocity observations by two instruments, lead to very strong constraints on the orbital elements, and ultimately, the dynamical masses of this binary object. Visual orbit of Gl 494 b. 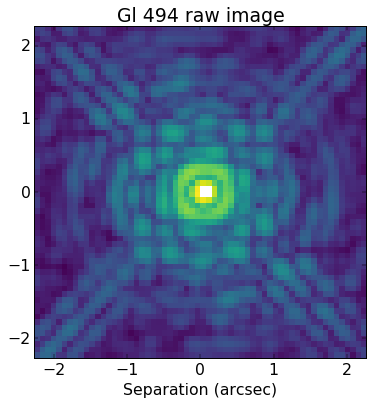 Radial velocity of Gl 494 induced by the presence of the low mass companion. A few months ago, I heard about an innovation contest organized by SATT Sud-Est, a company that attempts to facilitate the transfer of technology from laboratories to the industry. The application process looked simple enough so I gave it a shot. 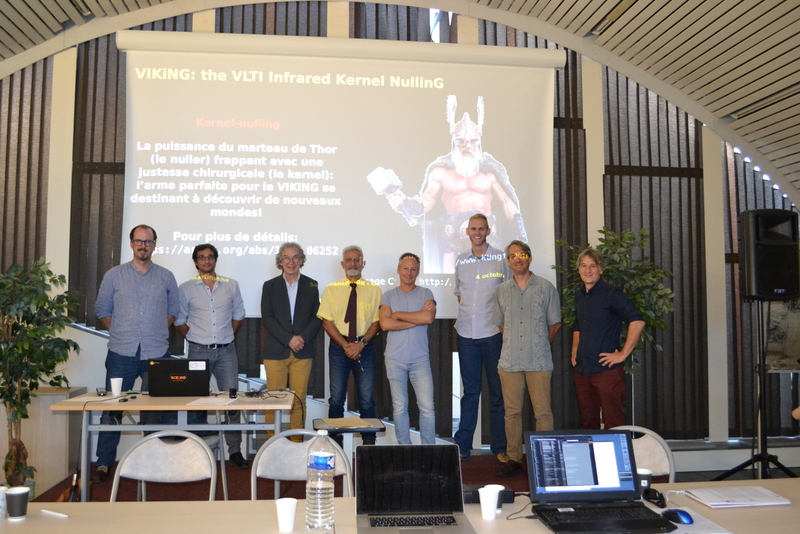 It turns out that my application: basically a pitch for robust high-contrast instrumentation (aka a kernel-nuller), was among the ten selected for a live oratory contest that was held just a few days ago, in the city of Avignon inside the famous “Palais des Papes“. All contestants gathered on stage. Without direct industrial prospect for the kernel-nuller, it is no surprise that my pitch was not selected as the final winner. The awards went to Dr. Christine Contino-Pepin and Pr. Michel Alain Bartoli who will I have no doubt, be able to turn their ideas into profitable businesses! Nevertheless, this was a lovely evening, and according to the feedback I received during the networking event that followed, attendees were quite intrigued and enthusiastic about the project. This is the real magic of astronomy in general and of extrasolar planets in particular that still manage to trigger people’s imagination. Even if science in general isn’t the most popular topic of conversation out there, public conferences about astronomy still manage to draw reasonably large and passionate crowds! If only we could trigger the same kind of amazement for all of the other sciences, the world would certainly be a better place! 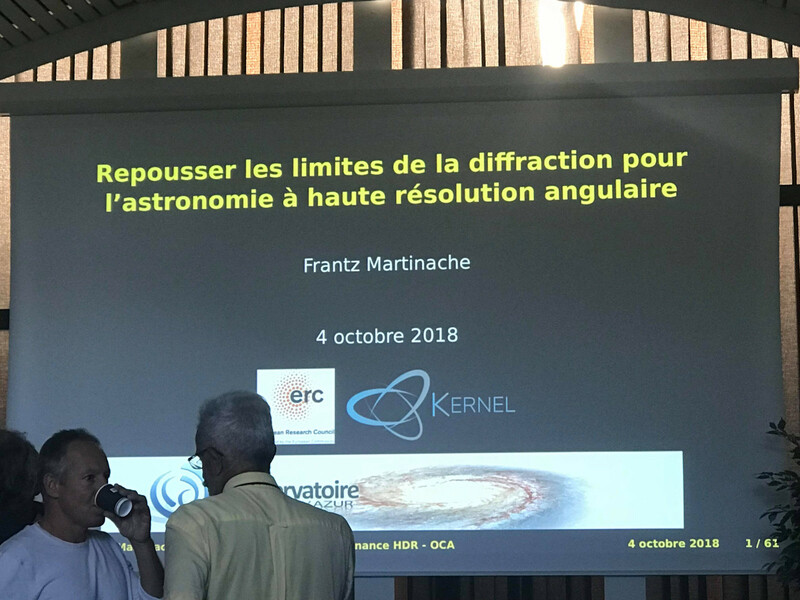 Le jeudi 4 octobre 2018 à l’Observatoire de la Côte d’Azur, j’ai enfin pu soutenir ma thèse d’habilitation à diriger des recherches (HDR), intitulée: “Repousser les limites de la diffraction pour l’astronomie à haute résolution angulaire”. m’a fait l’honneur de me décerner l’habilitation à diriger des recherches en sciences… voilà une bonne chose de faite! Le fichier de ma présentation (beamer PDF) compilé depuis org-mode de Emacs peut être téléchargé depuis ma page web (30 Mb)! It is my great pleasure to be able announce that the paper Mike Ireland (ANU) and I wrote, entitled “Kernel-nulling for a robust direct interferometric detection of extrasolar planets” has been accepted for publication by Astronomy & Astrophysics. 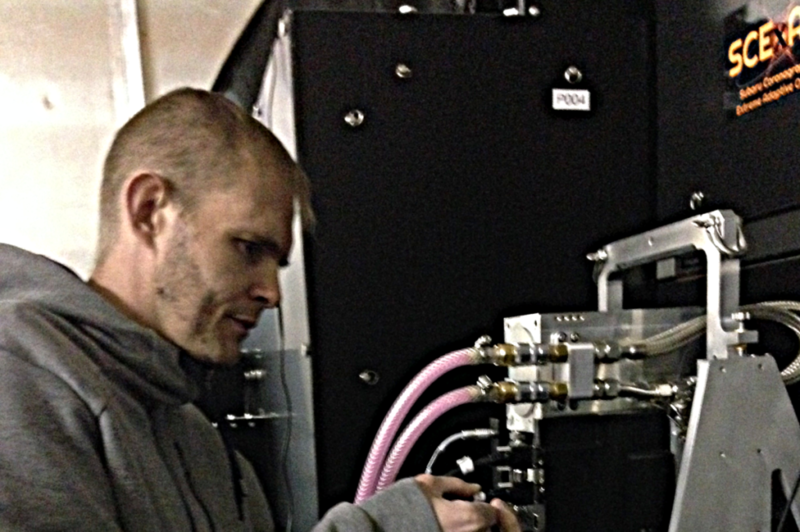 The paper introduces a baseline class of nulling-interferometers producing outputs that can be robustly calibrated. These new observable quantities exhibit properties that are similar to closure- and kernel-phase, while taking advantage of the use of a true nulling stage. The first version of our paper had been previously announced. The (updated) preprint of the paper is now available on arXiv. It is fantastic to have this piece accepted: the quest for robust high-contrast solutions has been on my mind for a while… And now that we know that at least one solution exists, surely others must do too! 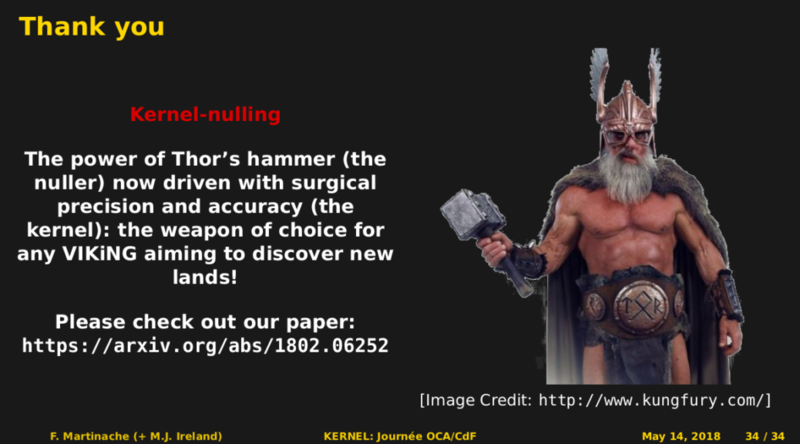 Conclusion slide from a presentation I gave, describing Kernel-nulling and the VIKiNG instrument concept it leads to for VLTI. 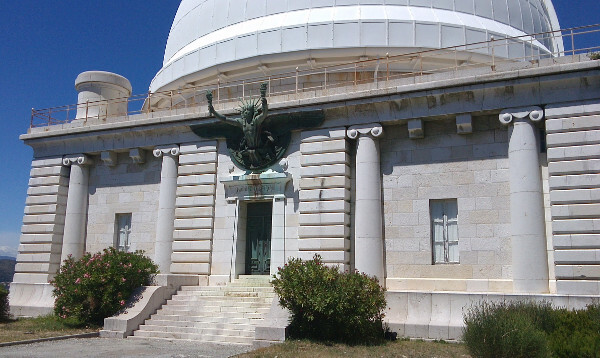 The KERNEL project, hosted by Observatoire de la Cote d’Azur (OCA) invites applications for a postdoctoral research position in the field of high-angular resolution astronomy starting no later than February 1, 2019. This position is funded by the European Research Council (ERC – CoG – grand agreement #683029) under the European Union’s Horizon 2020 research and innovation program. KERNEL aims at enabling every optical and infrared astronomical facility to reach its ultimate angular resolution potential, often pushing beyond the formal diffraction limit, while preserving the full sensitivity. 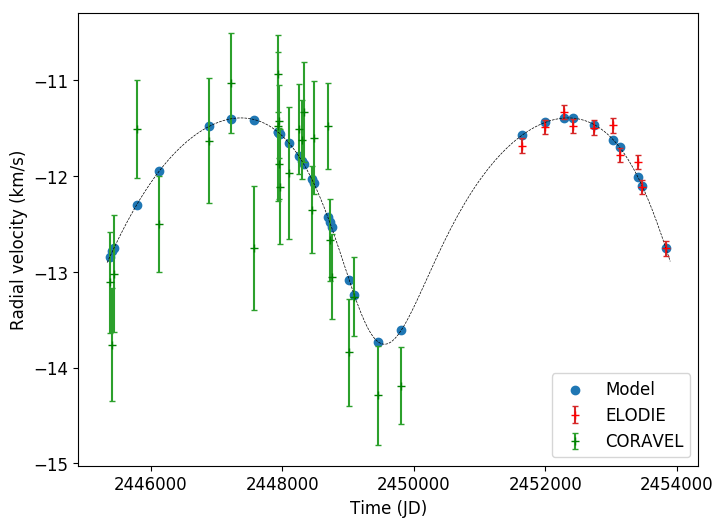 By looking at astronomical data as the result of an interferometric process, the KERNEL framework brings much needed robustness to high-performance observing techniques, required for instance for the direct detection of extrasolar planets. The KERNEL framework offers a wide range applications that go from the post-processing of available archival data to high-performance focal plane metrology, partly coupled with high-contrast imaging. 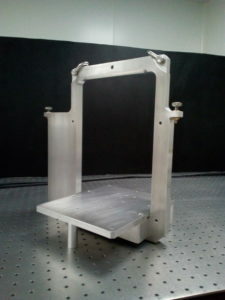 In order to develop and prototype the next generation of high-performance instruments and metrology monitoring tools for ground based telescopes and interferometers, the completion of the KERNEL project includes the construction of a general purpose test-bench, with elements that have already been successfully deployed for on-sky applications. The postdoc responsibility will be to oversee the completion of this KERNEL test-bench. The test-bench primarily relies on a high-order segmented deformable mirror used to modulate the phase across a diffractive aperture and a high-cadence low-readout near-infrared camera, simultaneously in up to four complementary spectral bandpasses. it extends the range of tolerated input instrumental phase, with applications such fringe tracking for long baseline interferometry and adaptive optics for large telescopes. In addition, with its simple but agile high-contrast mode, the bench will also make it possible to experimentally validate observing strategies devised in the context of the project that bring robustness to aberrations to high-contrast direct detection. A Ph.D. in astronomy, physics, or a closely related field is mandatory. We are interested in individuals with several years of post-PhD research experience in the development and the scientific exploitation of instrumentation in the field of high angular resolution astronomy that include active wavefront compensation either in the laboratory or at the telescope. The candidate should be willing to collaborate with and assist graduate students that will use the KERNEL bench for their research projects. 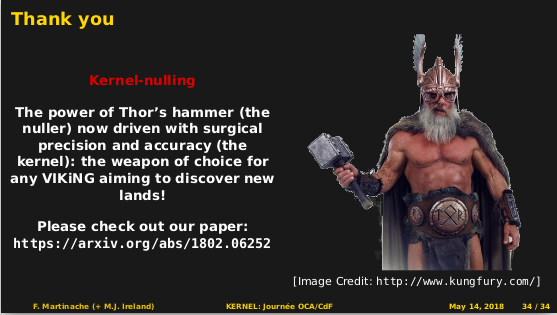 The candidate will also be encouraged to take advantage of the experimental setup and the KERNEL project members expertise to pursue his/her own research interests. The candidate must also possess a strong background in the modeling, reduction and interpretation of diffraction dominated data (interferograms and/or AO-corrected images). Experience with the Python and/or the C programming language is highly desirable. The initial appointment will be for two years, with possible extensions up to four years. The successful candidate will be hosted by the Lagrange Laboratory, with a lab located on the campus of Valrose, downtown the beautiful city of Nice, France. To apply, please send a copy of your curriculum vitae, and a summary of your research interests. Also arrange for three reference letters to be sent to Frantz Martinache (frantz.martinache@oca.eu). For full consideration, applications should be received before September 15, 2018, although applications will be reviewed up until the position is filled. 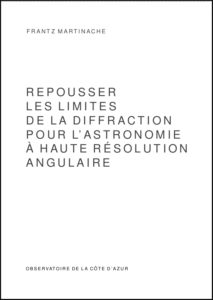 Dans le but de soutenir mon Habilitation à Diriger des Recherches (HDR), j’ai soumis à mes rapporteurs la première version de cette thèse, intitulée: “Repousser les limites de la diffraction pour l’astronomie à haute résolution angulaire”. Si mes rapporteurs m’y autorisent, la soutenance de cette thèse de HDR devrait avoir lieu le jeudi 4 octobre 2018, à l’Observatoire de la Côte d’Azur, sur le site du Mont Gros. 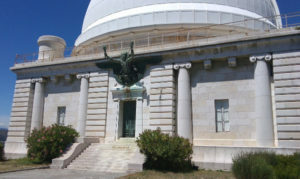 Entrée de la Grande Coupole de l’Observatoire de la Côte d’Azur, sur la colline du Mont Gros, à Nice. Pour les curieux, une page de Wikipedia explique ce qu’est la HDR et quel est le rôle de cette tradition qui ne semble exister qu’en Europe ainsi que dans quelques pays d’Afrique du Nord. La thèse est évidemment écrite en LaTeX. Pour la mise en page, j’ai choisi d’utiliser la classe tufte-latex, inspirée par les publications de Edward Tufte. La lecture de son livre intitulé The Visual Display of Quantitative Information et de son essai intitulé Essay: The Cognitive Style of Powerpoint: Pitching Out Corrupts Within durant mon premier contrat de post-doctorat à l’Université de Cornell ont eu une forte influence sur ma méthode de communication scientifique: je les recommande tous les deux! K-CAM: the KERNEL camera, is installed at the focus of SCExAO! 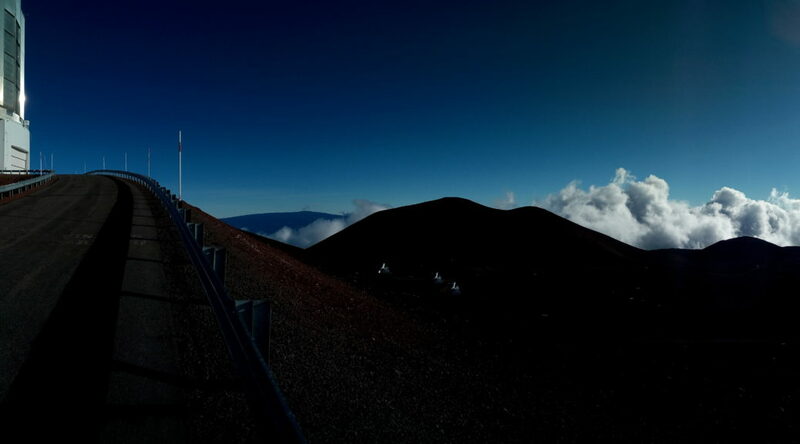 Toward the end of June 2018, the C-RED-1 camera built by First Light Imaging for the KERNEL project was installed on the Nasmyth IR focus of the Subaru Telescope and coupled with the SCExAO instrument. Custom frame designed by Romain Laugier, KERNEL project PhD student and built by the OCA’s S2M service, to couple the C-RED-1 camera to the IR side port of SCExAO. Frantz Martinache (KERNEL PI) reconnecting the KERNEL project C-RED-1 camera after installation of the camera on the IR side port of SCExAO. 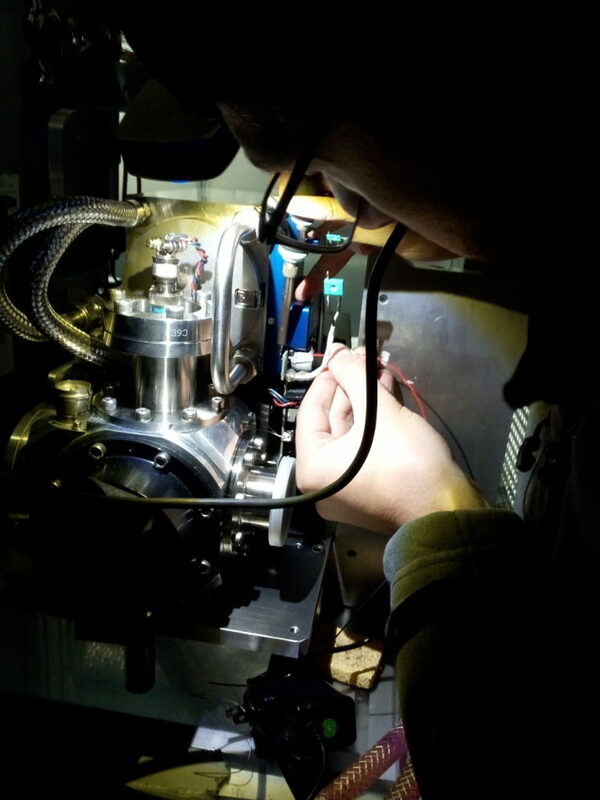 Action shot of KERNEL PhD student Romain Laugier, fixing broken connections to the pulse-tube cooler of KCAM. K-CAM: The KERNEL project C-RED-1 camera, is finally ready to observe on the IR side port of SCExAO. 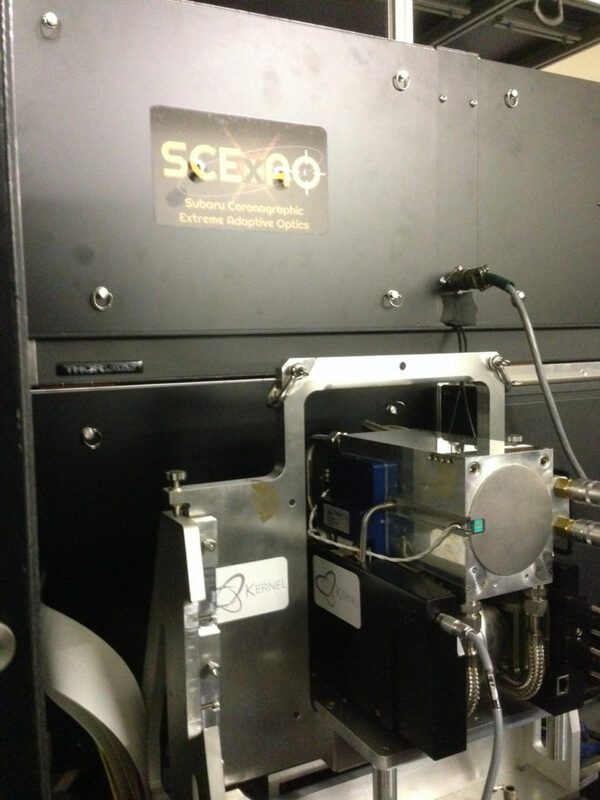 Although it took more work than anticipated, the camera was successfully integrated to the SCExAO instrument both optically and in software, now using a VisioLink F4 frame grabber sold by EDT. The optics inside SCExAO make it possible to send light in focus to this camera and the images produced by the camera are written to shared memory so as to be integrated with the rest of the real time SCExAO software environment. In its default full frame mode, the C-RED-1 makes it possible to acquire frames at 3.5 kHz. In its smallest window mode, the camera can run a little over 71 kHz. The high sensitivity of the camera, coupled with the high frame rate, are real game changers in the realm of high-contrast imaging and really make it possible to envision driving a deformable mirror directly from the focal plane. At these speeds, speckles don’t stand a chance! The camera was partly commissioned on-sky during unfortunately rather poor observing conditions… but engineering observations are planned for October 2018 so this camera will get its chance to shine! The software running the “K-cam” camera is maintained on Frantz’s github page. Pour la troisième année, j’interviens dans le programme MEDITES dans un parcours pédagogique qui présente la recherche en astrophysique à des élèves du secondaire. Cette année, le parcours est focalisé sur les méthodes observationnelles en astronomie: astrométrie, photométrie et spectroscopie, et parlent en particulier de la mission Gaia. 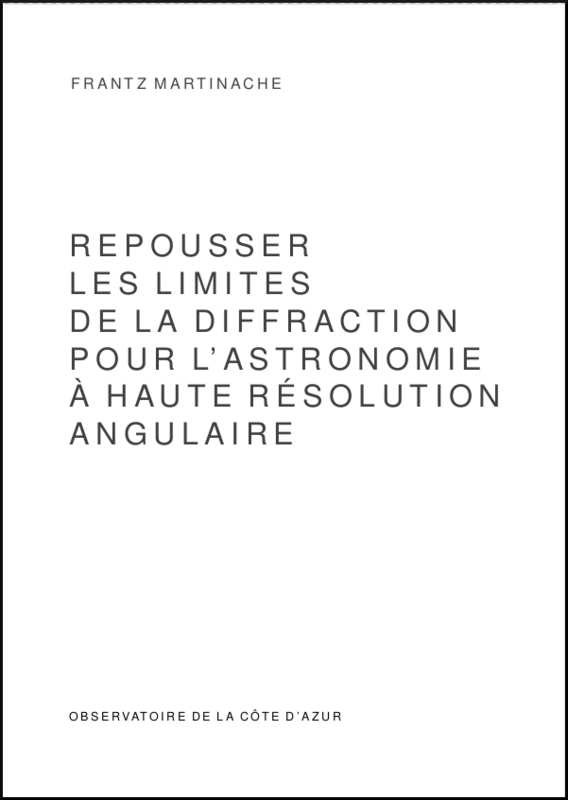 Les supports des présentations que j’ai préparés pour l’astrométrie et la photométrie sont disponibles ici. 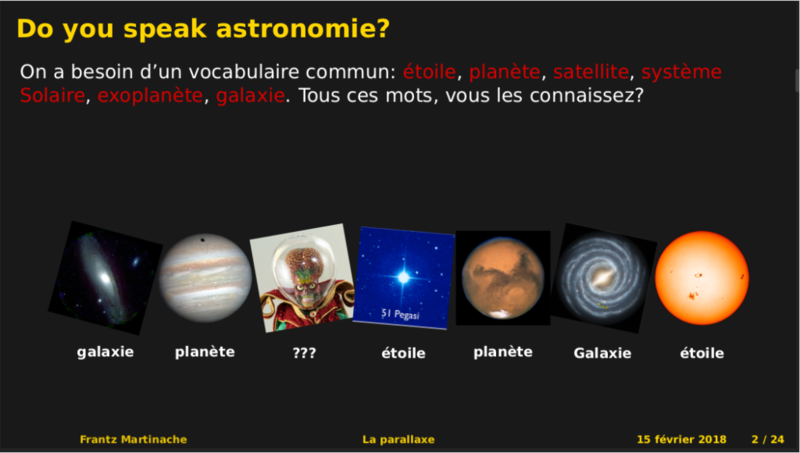 Slide extrait d’une présentation sur l’astrométrie et la mesure de la parallaxe faite dans le cadre du programme MEDITES. 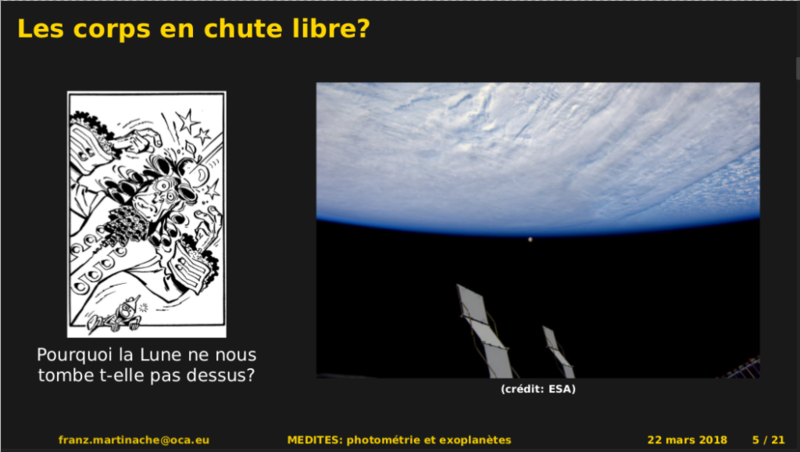 Slide extrait d’une présentation sur la photométrie et les propriétés physiques des planètes extrasolaires faite dans le cadre du programme MEDITES. 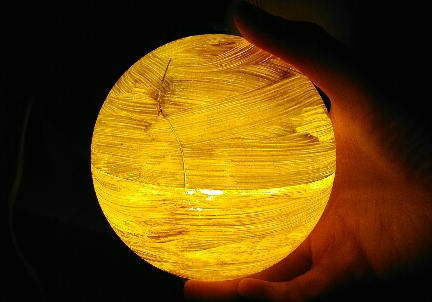 Pour ce parcours, j’ai mis au point et construit une expérience constituée d’un simulateur motorisé de couple étoile-planète et d’une mesure photométrique temps réel par une photodiode connectée à une carte Arduino. J’ai également développé un petit programme d’acquisition des données collectées par la carte Arduino qui permet de faire du traitement a posteriori des données photométriques. Un tutoriel décrivant la fabrication et l’utilisation de cette expérience sera publié cette année par le site du service éducatif de l’Observatoire de la Côte d’Azur.